"Greater Greece". The Greeks by the Summer of 1921, had advanced to within 30 km of Ankara, there the critical battle of the Sakarya River ended the advance. The failure of the battle now turned public opinion at home and amongst troops in Turkey against the war. 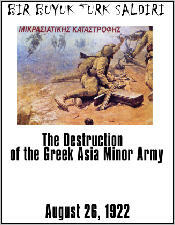 From 1921 to 1922, the Greek Asia Minor Army held a 400 km front line. The Greeks were hoping and desperately looking for a honorable way out of the mess that the British had got them in. Greece was going broke because of the war and depended on England to provide monetary loans. Greek morale wavered. The Turks under Mustapha Kemal (Ataturk) were about to give a good reason for the Greeks to leave. The game is operational, 2 miles a hex, battalions and regiments. Units have two combat strengths and there are two movement phases. Reserves are important. Supply is critical. 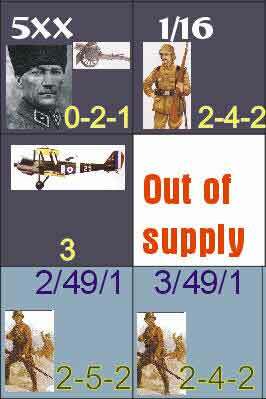 Units include infantry, cavalry, artillery, aircraft and HQ's. Each turn is 12 hrs. 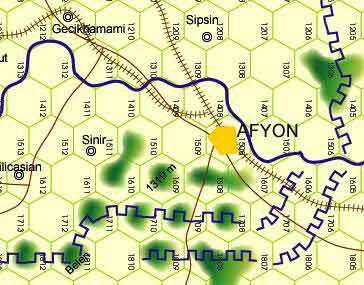 There are two games, the campaign from August 26 to 31st and "The Pocket", where five Greek divisions are trapped from August 29-31. The game is not complex and can be completed in two hours.